Has the Owl man returned to Haverfordwest? Will the OWL MAN make an appearance tonight? Based at St Thomas Church Yard, Haverfordwest, Pembrokeshire. It’s not all ghosts, hauntings and UFO sightings at The Paranormal Chronicles. Occasionally a bizarre case will come our way but has just enough plausibility that we are obligated to investigate. I had heard about this strange creature when I was growing up but it had become forgotten and lost and when the subject re-emerged a few months ago then I just had to take a closer look. When I was around eleven years old I had started to get interested in the paranormal and at this time there was an old drunk that lived near me. He was a former crew member on a merchant navy ship but a kindly enough man. He was a character to say the least with every other word a colorful metaphor and he seemed perpetually attached to a tankard of his home brew. One summer he told me that around twenty years previously (This would have been the mid 1960’s) that he was walking (drunk of course) through the St Thomas Church yard in Haverfordwest one night on his way to another pub when he was frightened out of his wits by a “Giant owl” that flew from a tree above him and landed in front of him. He claimed the owl creature was about 6 feet tall had the legs of a man, the wings of a bird and a round face made up of white hair and feathers with a protruding nose not a beak. The fellow said that he sobered up quickly and ran as fast as could and when he found safety in the pub he found nothing but ridicule and jokes at his expense apart from an elderly man who claimed that he had seen the Owl man around 10 years previously which had frightened him early one morning while the town was still slumbering before the start of a new day. I quizzed my drunken man for further information but that was all he could re-cant, he said one minute he was drunk the next he was running for his life. Now, obviously as excited as I was by this tale I had colossal amounts of doubts as the man was in fact inebriated most of the time however to his credit this was the only time he ever shared a story of its ilk as they usually consisted of him rambling on about his navy days. That Character sadly died a few years later due to alcohol related illness and with him the Owl man and as I moved on in life, the story was filed away deep in my mind. That was until recently. A young couple were walking through St Thomas’s on their way to the Haverfordwest town centre in early November, 2013. To help set the scene, St Thomas’s is a church that has stood proud above Haverfordwest for over quarter of millennia and serves the local parish. 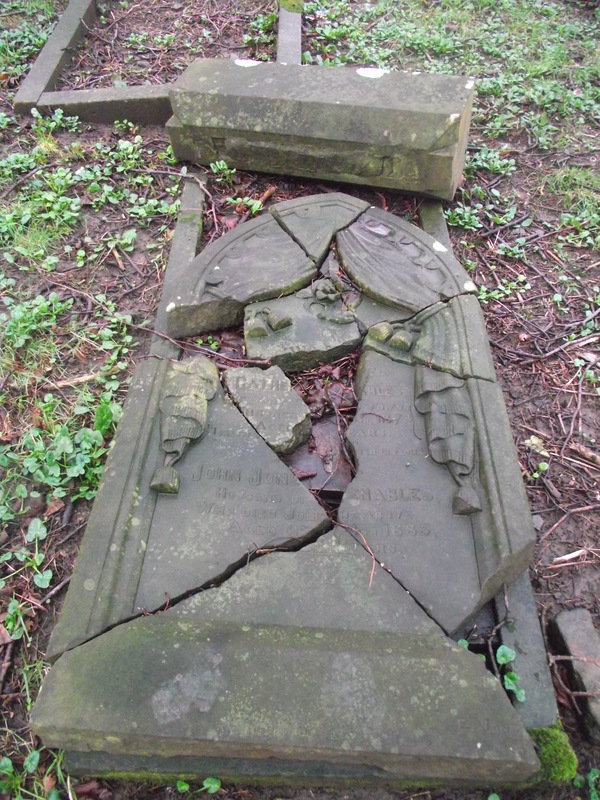 Today it is surrounded by broken graves and rusted spiked railings with tall dark tree’s towering above. A lane runs along the grave yard and the backs of the old houses of Goat Street. In the grey light of winter it is the epitome of a gothic setting. They claimed that a large man or creature covered in feathers had jumped down from one of the trees and ran through the church yard at St Thomas’s. They were frightened and they ran off down Goat Street and to the bottom of the high street. The young man returned with a friend a short time after to see if he could take a picture of the creature but to no avail. The girl spoke to some friends who had said they had listened to the live paranormal investigation I had conducted for Halloween which was broadcast on 102.5 Radio Pembrokeshire and I was soon messaged by herself on Facebook regarding the incident. The girl shall remain anonymous until a time she feels more comfortable as she is well known at a local retailers and does not wish to be harassed or ridiculed however she has very kindly allowed me to publish her account in an attempt to see if anyone who reads this may have some information on the night’s events. GLD: So tell me in as much detail as you can what you saw that evening. Witness: We had just come from the cinema, it was around 10pm and we were to walk into town for a few drinks and meet up with friends as I was off the day after (Sunday). We walked the small road that leads to St Thomas’s and then the lane that runs through next to the railing and the church yard. It had a street light and I’ve walked it a few times and never felt threatened or anything. We were half way down, with the tree’s hanging above us and I heard this rustling and this thing fell and landed on the ground behind the railing. It was like a giant bird. GLD: When this thing fell did it land upright or did it land crouched? Witness: It landed crouched and then it stood up, stretched its wings and then ran off across the yard. I screamed and we ran. GLD: Did it make any noise that you can recall? Witness: We heard the rustling and it did make an Urrggh noise when it landed and then it ran off. GLD: What colour was the creature? Witness: It was dark but of what I recall it had white and grey feathers but mainly white. GLD: Recall as much as you can, I really need you to be there. I need you to be back in that moment, O.K.? I need you to remember how you felt, was it cold after leaving the cinema, can you smell the tree’s and vegetation as you walk past them. Are you excited to be going into town? Bring yourself back to the moment. Witness: It’s cold, we leave the cinema from the side entrance and people are heading off in every direction, some are laughing and chatting, a few cars pass us and we walk up towards the leisure centre, then we cross the road and walk left up that small street towards St Thomas’s and walk past the main gate. Some of the houses in the small street have the lights on. They look cosy. It’s cold outside. We are walking down the path and Dave (Boyfriend) has his arm around me and I’m excited to have a drink and get to the Friars (Pub) then I hear this rustling and this thing drops from a tall dark tree. It’s just a blur of white. It looks small, when it lands and then stands up. It’s the size of a man, tall really tall, it has its back to us and it stretches its wings and it’s covered in white and grey feathers. It looks huge. It then runs with its wings outstretched we don’t see its face or anything else and we ran. I didn’t see where it went too. GLD: Recall where the feathers came to; were they just on its arms, wings, and back or all the way down to its feet? Witness: No, the feathers came to say the back of its knee’s and then its legs were just grey. GLD: Skinny legs like a bird or thicker like a man’s. Witness: I’m not sure, it happened so quickly. Thick I think, not twig skinny. GLD: Did you see its feet? Recall, think hard did it have talons like a bird or feet like a man or something else? Witness: I can’t honestly remember. GLD: Owls populate the area could it have been an owl; would you recognize an Owl or other large bird? Witness: A man brought one into school once and it was massive but this one was huge, it was taller than my boyfriend and he is around six foot. GLD: What did your boyfriend say when he and his friends came back? Witness: He said they walked the path again and looked but could not see anything at all. My friend said it might be a swan but this was big, really big. GLD: Would you say it could have been a man dressed up? Witness: Yeah but why? He would have to hide in a tree in the middle of now where and then drop out of a tree. You could hurt yourself for a start. Everyone thinks I’m making it up but we did see something in the graveyard. I explain to her that this is not the first time I have heard this story to which she was relieved. I told her about an incident in the 1950’s and the 1960’s and she asked if I ever find any further information to please let her know. Or were perhaps local residents creating this creature to harass and scare for their own amusement or some other motive? I began delving through local parish records and looking at the census reports from the time the Church was built to Current times to see if they were any clues, anything of significance that could be attached to the sightings. In a newspaper clipping from 1963 it stated that some pedestrians using the side lane along St Thomas’s had been startled by a man in strange garb that had leapt out at them making strange sounds. Surely this was our Owl man? I now had 4 potential sightings stretched over a 50 year period, one recorded in the local paper and recent account just months old. My immediate reaction was that this was no paranormal creature, nothing to get the cryptozoologist excited about. This was, I believed, a man and for whatever purpose was dressing up as a bird and frightening unsuspecting passers-by at St Thomas’s. The clues were that the creature crouched and make a “Uggh” noise when it landed just as a person would if it fell or leapt from any great height, that when it’s wings were spread that it had man sized grey legs and it ran off immediately not giving anyone a detailed look at its features. This person liked the thrill and the element of terror he imposed on the unsuspecting plus he liked his anonymity as surely after 50 years someone would know who he was. Now he was either very old and had come out of retirement a few days after Halloween 2013 despite perhaps being in his 70’s or 80’s or someone had taken up his mantle. This was now my main focus to find out who was doing this and why. After some interviewing some locals I was informed that a lady that had lived in the area for over 50 years was still a resident in the area. I had to speak to her as surely she would have heard of this strange occurrence. Mrs Thomas (You get used to such coincidences) was a widow in her late 70’s and had lived in the area for over 50 years and was delighted to speak to me. She offered me in and we sat in front of her fire with tea and biscuits and I explained what I was investigating and how I had come to be speaking to her. She sat back in her chair and she began to chuckle. This is what she told me. When I was about 20, maybe younger, it was after the War, I remember that much and it wasn’t like it was today as a lot of the courting we did was done quietly and out of the way and we used to go to St Thomas’s. We used to dare each other to go in and see if ghosts would get us and some of the boys, well, they were only after one thing. Now I remember this one lad and he had some kind of slowness, I think today it would be said that he had learning difficulties. He had a child’s mind but he was older than us maybe mid-thirties and he would follow people up there at night. I think he was just lonely and wanted attention but now and then he would jump out and scare people. I think his name was Harry or something like that. I felt he was harmless enough; never hurt us or anything like that. He just made us jump all the time and make this weird laughing noise and run off. Now one night he jumped down at us, making bird noises and such and he had this big cloak on with feathers and string tied to it and it gave us quite a fright but it was Harry. Now as the years went on I’m sure he kept at it as now and again you would here of the Owl man or a bird man at the Church yard but it was Harry. I had forgotten about it till now. I asked Mrs Thomas if Harry was alive if he could be contacted and she said that Harry had been dead thirty years or more. I pursued the matter asking her if someone could possibly have continued his ritual of scaring people and she was adamant that no one could have. Harry was almost hermit like and occasionally he would be seen in the town in later years with his long white hair and beard but kept himself to himself but he had no family and no real friends that she knew about. Perhaps Harry’s exploits have inspired someone to continue with the Owl man shenanigans, maybe a neighbor or a rare friend of his inherited his feathered cloak and the idea or as Mrs Thomas said: Maybe It’s Harry’s Ghost, still haunting the grounds of St Thomas’s to give a scare and a fright to unsuspecting town folk as they pass through in the night. As an investigator you can never have a clear cut opinion on what you are going to investigate. As one door closes another one opens and just when you think you have all the answers, the paranormal world changes all the questions. If you have more information on the Owl man incidents or any experiences that you wish to share or maybe you just wish to contact us then please email us at:paranormalchronicles@aim.com and please press the follow button so you never miss an update or post from us. If you enjoy accounts of the Paranormal then why not read the #1 Bestselling novel and audio book A most haunted house by G. L Davies . 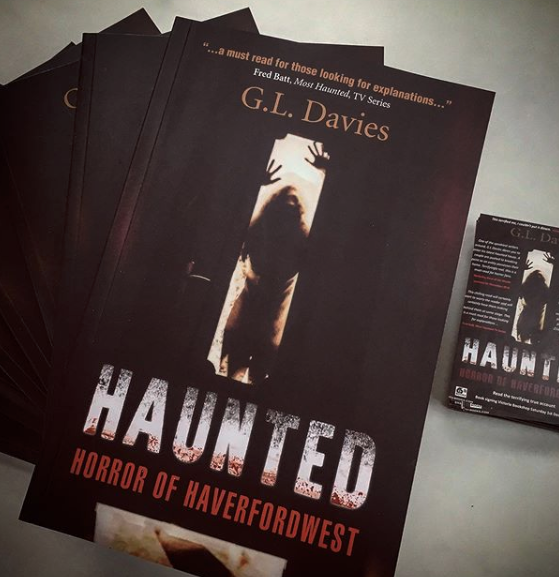 A most haunted House is based on a true and terrifying account of a prolific and aggressive haunting in the small Welsh Town of Haverfordwest in West Wales. Seen as controversial and sparking debate between skeptics and believers alike due to the ferocity and intensity of the haunting, A Most Haunted House is the eye witness account of a young couple fighting to keep their new home and each other as an entity tears their world apart. It’s free to Borrow through Amazon Prime and is also available in paperback and Kindle or listen to on AUDIBLE or i-tunes. Next Did Ghost ruin Honeymoon? you don’t have a fundamental understanding of singing vocabulary.